Mahogany, teak, jarrah – all names that you’d usually associate with high quality furniture. Unfortunately, demand for these timbers have seen vast swathes of deciduous and tropical forest habitat destroyed. Items now made from these trees are incredibly expensive. But rubberwood? It probably doesn’t stir up the same sort of associations of quality, but you’ll soon start seeing it incorporated into furniture and other timber products more often. Rubberwood comes from.. you guessed it.. the rubber tree (aka Pará rubber tree or Hevea brasiliensis). 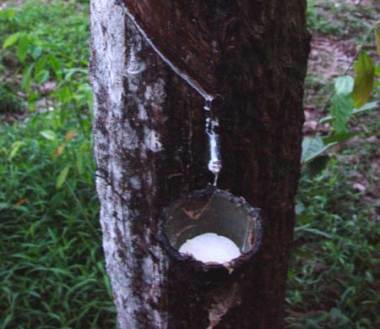 The rubber tree exudes a latex sap, the world’s primary source of natural rubber. Rubber trees have a straight trunk and grow an impressive 75 feet or more over their lifetime and mature trees have a diameter of around 3 feet. They are grown in densities of approximately 90 trees per acre. Over 36 million acres of rubber trees are currently being grown in the tropical regions of Asia, Africa and America. The trees are harvested for their latex each year, but by the time they get to around 30 years old, latex yields decrease to the point that it’s not commercially viable to tap the tree any more. In the past when the rubber tree reached this stage, it would be felled and burned on the spot or chopped up for firewood to make way for a new tree – but the wood is now being used extensively in furniture, flooring, construction and even toys. Given their large size, a single tree can provide a great deal of timber. Rubberwood is strong, flexible, resistant to fungus, bacteria and mold. It’s compatible with most industrial adhesives, easy to work with and has a beautiful grain suitable for quality furniture. The wood is a pale cream to yellowish brown color and is easy to stain to gain deeper colors. The finish adaptability is rated at 94% of that of teak under standard conditions and comparable to beech for workability. While the clearing of rainforests to date to make way for rubber plantations is very regrettable, it’s great to see that rubber trees are now being used for more than just their sap and firewood – it’s an incredibly versatile tree and given there’s no shortage of supply, there’s great economic potential for the countries involved in the rubber industry. Maybe the added value of the tree will mean these countries won’t have to knock down more forests as they’ll make more from the land already under under plantation – one can only hope. So next time you’re out shopping and you see rubberwood furniture or products, don’t let the name of put you off; it’s an eco-friendly, sustainable and high quality wood! Added note from Michael: since first publishing this article, I’ve had a lot of requests about sourcing rubberwood in the USA and many questions I haven’t been able to answer regarding the product as I’m not a rubberwood expert. So, I’d like to make note of a company that is – Bingltd.com is an importer and supplier of rubberwood to US buyers. According to their site, Bingltd.com sells rubber wood grown, harvested and processed inMalaysia, sourced via rubber tree replanting programs to ensure continuity of supply and preservation of theenvironment. If you’re looking to import rubberwood either as furniture components or dimension wood, you contact them here.